Install these bulbs in your C9 (E17 bases) cords or shop for new C9 Christmas light cords here. The neighbors will be jealous when they see these Twinkle Bulbs. Your Beach Themed Weddings will have a new level of sparkle. Be sure to purchase the Christmas light clips, hooks and stakes used by professionals across the country for sharp lines and easy installation. 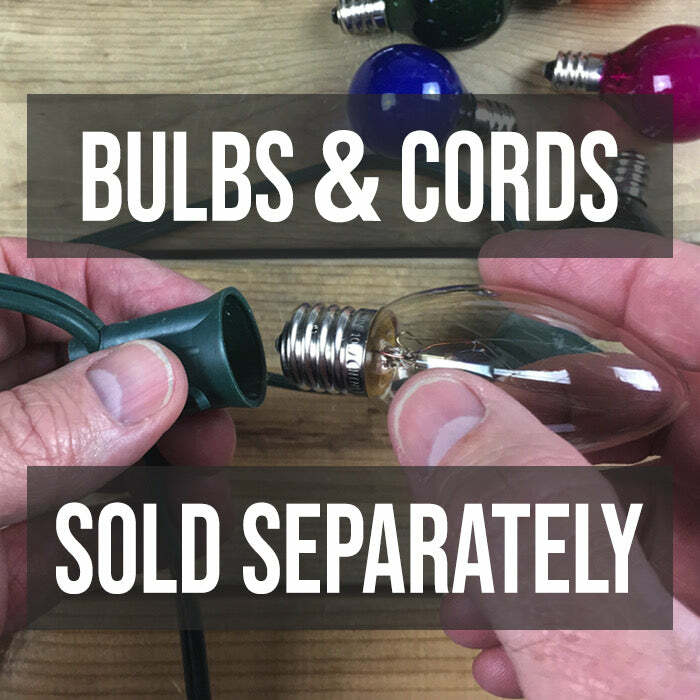 Install these bulbs in your existing C9 cords with E12 (candelabra) bases or choose new cords from our wide variety of lengths, colors and spacing. Tailor your spacing selection and length based on the size of your project. Bought these to supplement the multicolor box. Grand daughter loves the color. High quality no problems. Q: How many times is this C9 twinkle light dipped? I've read other replacement bulbs that were dipped 2 to 3 times. Thank you. A: These are dipped twice! Only our triple-dipped steady-on bulbs are dipped in paint three times. Great questions, thanks for asking.